I've always been a dog person, so I know when I was planning my wedding there was never any doubt that our guest list would include a few four-legged family members. Here are 3 tips I've learned over the years to ensure beautiful wedding photos while including your furry family members. 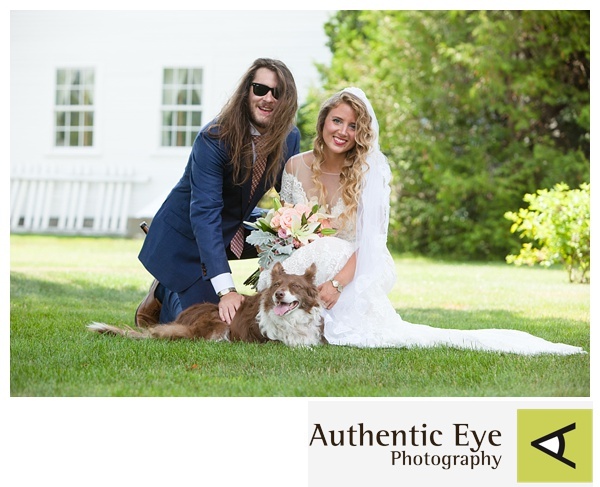 Want to include your dog on the wedding day, but maybe not in the ceremony, no problem! Have a friend or hire a dog walker to bring the pooch after the ceremony for a few photos. Your dog is going to be so excited to see you (I mean it’s probably been an hour or two since they saw you last), so have someone give them a good workout while you are exchanging vows. Tired dogs are much more photogenic and less likely to put any muddy paws where they don’t belong! TIP: A little exercise goes a long way prior to this kind of shoot. TIP: Consider a day after (or month or a year-after) photo shoot where we can capture your whole family. There are many reasons you may choose to give the pooch a vacation while you get married. Your four-legged family member can still be part of the photos. Having a hard time find a beautiful resort to host your wedding that is dog-friendly? Many resorts may give you a temporary exemption for photos or waive this policy entirely just for the wedding couple’s fury friend. It never hurts to ask! TIP: Ask if they will waive the pet policy for you.